Live photo of duplex residential building for Mr Dhirendra Sahu at gudiyari Raipur. Front elevation is being treated with elevation tiles, remaining part with two coats of exterior putty and paint. Main gate has been created of stainless steel and similar arrangements has been thought for top railing also. We succeed in getting our drawings and actual construction close to each other as far as possible. We believe that we are one of the emerging Architects the Raipur City. Residence for Mr. Dhirendra Sahu. This really one of the master piece Residence with great planning accompanied by minor circulation space and maximum free space. The extraordinary front elevation is something being admired by the most of the people. Hope you enjoyed our consultancy. Architect Shadil is being associated with best architects, best interior designers and best civil engineers in the city. Proposed elevation for Mr JK Jain Shanti Vihar Colony Kota Raipur. It is an alteration to a two storey building and and proposed 3 story residence. The building is wholly conceptualised and being supervised by architect shadil and team. Proposed elevation for Mr Sunil Agarwal at Lakhanpur Ambikapur Chhattisgarh. Conceptualised by architect Shadil and team. 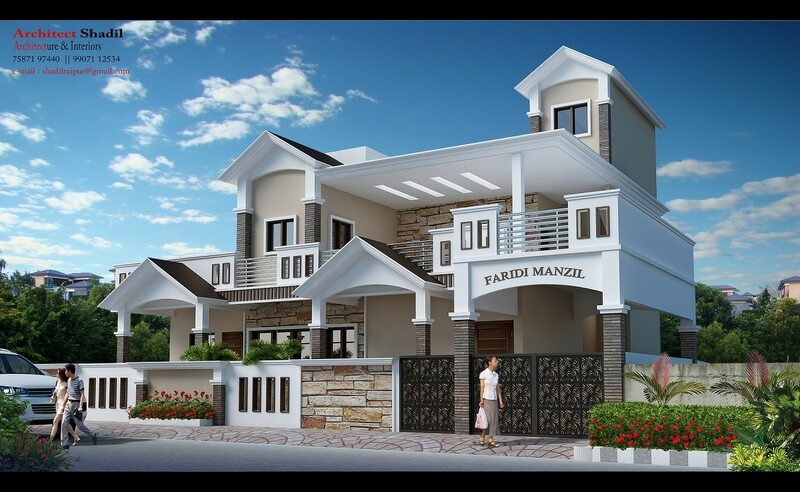 Clients sometimes demand us to show some ready-made elevations for them. However, there is nothing like one size fits all item for maximum of them. Each building is sketched out by an architect differently. May people understand it. A triplex residential building at Raipur Chhattisgarh. Conceptualised by architect shadil and team.